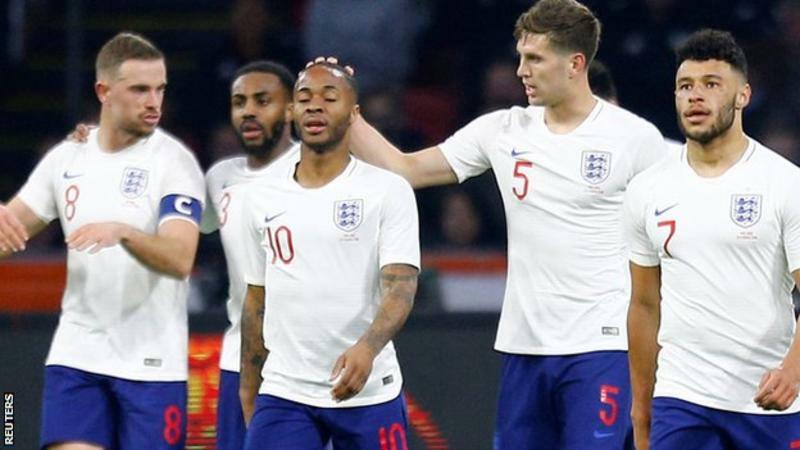 England forward Raheem Sterling has urged fans to "give love" to the team going into this summer's World Cup in Russia. They have three more warm-up games before the tournament, starting with Italy at Wembley on Tuesday, having beaten the Netherlands 1-0 on Friday. Sterling told BBC Radio 5 live: "I feel sometimes there is too much negativity. "I would love to hear some positive notes coming in, just to let the boys know everyone is behind them." England were unbeaten as they topped their World Cup qualifying group, winning eight out of 10 matches, but their recent performances have not always impressed the supporters. Gareth Southgate's team, who face Tunisia, Panama and Belgium in their World Cup group, have gone five matches without conceding a goal, but have scored only three times themselves in that period. Sterling, 23, made his international debut in 2012 and has won 36 caps, although he has been subjected to boos at stages of his England career. "If you want your country to do well as everyone says, bring a positive light to it," the Manchester City winger said. "Make the boys go off to the World Cup with a clear head, that everyone is behind them and everyone is with them, and trust me I think you would definitely see a better England. "I think if we get behind those players, give them love, you wouldn't know how much that will help them, how much that would boost their confidence." Asked about receiving criticism from the England supporters, he said: "Obviously it's disappointing when you put on a shirt and get negative feedback, but at the same time it's what the fans want to see, they want to see you perform well. "They are probably not doing it in a malicious way, but doing it in a way to make you know you need to step up. In a way it's good for someone like me, I kind of thrive on stuff like that to try to build. "I think at times we are judged a bit too early. I think it probably doesn't work in our favour, but I think with the support in this country, I think if we do that a lot more, you'll see a lot more of the players coming through."